With the emphasis on smartphones and tablets at this year’s CES, it should come as no surprise that the various SoC IP developers are focusing their announcements around the show, and Imagination Technologies is among them. 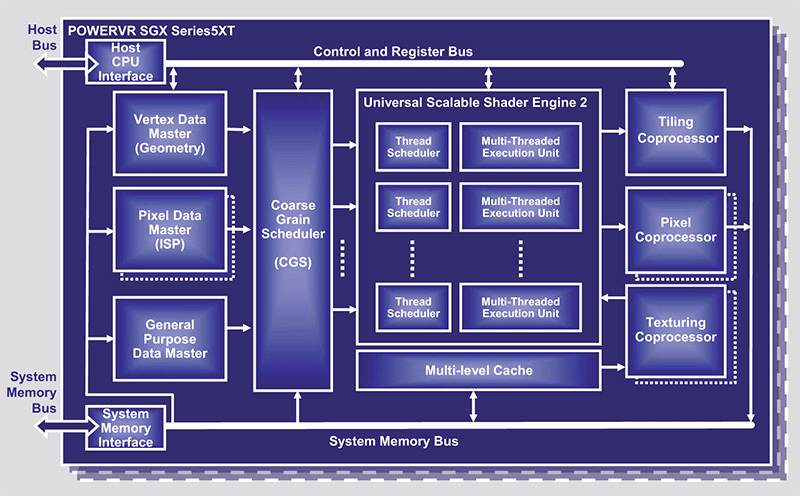 In 2011 Imagination announced their next generation of SoC PowerVR GPUs, the Series 6 family, based on the PowerVR Rogue architecture. Now just under a year later Imagination has announced that they’ve officially released their first GPU designs to licensing for inclusion into SoCs. Shedding more light on feature support for the first time, Imagination has announced that the baseline graphics feature set for Series 6 will include support for OpenGL ES “Halti”, the current working name for ES 3.0, itself derived from OpenGL 3.x. In terms of DirectX generations, this would make Series 6 a DirectX 10 part, analogous to the GeForce 8/9/200 series, the Radeon 2000-4000 series, and Intel’s HD2000/3000 iGPUs. Interestingly enough Imagination will also be offering designs that are DirectX 11.1/OpenGL 4.x compliant, which would bring them to parity with the very latest GPUs from AMD and NVIDIA. Meanwhile on the compute side OpenCL will also be supported, and while Imagination doesn’t list the specific version we believe they will be conformant up to version 1.1. Microsoft’s DirectCompute is not specifically mentioned, however at a minimum the DX11.1 parts would need to support it. Unfortunately at this time Imagination is still playing their cards close to their chest, so while we know what APIs Series 6 supports, we don’t know much about the configuration of the first two GPUs: G6200 and G6400. G6200 features two “compute clusters”, while G6400 features four of them, though beyond shader blocks we don’t know what a compute cluster entails. Most likely Imagination is configuring their GPUs in a method similar to the SGX543 series, where a fixed frontend is coupled with a specific number of shader blocks and ROPs, along with several fixed function DSPs. The biggest question perhaps is whether Series 6’s geometry performance will once again be fixed; SGX543 only scaled the number of USSE2 pipelines, so while Imagination could grow the number of pixels they could deal with geometry performance was solely a function of a given GPU’s clockspeed. Long term Imagination is planning to have designs that offer up to 1 TFLOP of shader performance, which would be nearly 10 times the theoretical shader performance of the SGX543MP16. The initial G6200 and G6400 will be much more conservative, though we don’t have specific performance estimates for them yet. Finally, as Imagination is an IP vendor, there isn’t any kind of timeline on availability as this is up to their customers. The only SoC announced to use Series 6 so far is ST-Ericsson’s Nova A9600, which is not scheduled to arrive until sometime in 2013. Given the fabrication ramp-up schedule for most SoCs, any Series 6 equipped SoC is still a year out if not more; in the meantime there are still a number of ARM A15 + SGX543/544 scheduled for later this year. And for larger, more capable GPUs such as the SGX545 the release gap has been closer to 2 years, so DirectX 11.1 SoCs in particular are almost certainly 2014 products assuming Imagination gets a DX11.1 GPU design out this year. We’ll have much more on Series 6 later this year as further designs are announced and Imagination publishes more details about the underpinnings of their PowerVR Rogue architecture, so stay tuned. Thanks for the update Ryan, we have been waiting for this news for a long time. However have you made a mistake about Adreno 3xx series supporting dx11? Thanks. By the looks of it then, although we have no solid news on Adreno 3xx, we can assume that it is competitive with power vr 6 series. Those who know me (well) would also know that I've been waiting for news on Series 6 since it was announced. Finally!